The train tottered into the Irish village on a clear, cold morning, the 29th of February, 1888. About 100 dignitaries packed into eight passenger carriages that wobbled behind the locomotive. A crowd waited at the end of the line within view of a 14th Century castle ruin perched atop a cliff overlooking the Atlantic Ocean. The air smelled of sea brine and turf fires. Local officials, clerics and farmers cheered the train’s arrival that Leap Year morning. It was the moment the people of Ballybunion had awaited for years; the day their village at the western edge of Ireland became linked by rail to the rest of the country. But it was no ordinary train that arrived from Listowel, a larger market town nines miles to the southeast. It was a monorail. The locomotive and other cars draped saddle-style over a single rail atop A-shaped trestles set 1 meter over the bogs and pastures of CountyKerry. The unusual model was designed by French engineer Charles Lartigue, one of the dignitaries who stepped from the carriages that crisp winter morning. There was nothing else like it in Great Britain, and only a few similar systems in the world. The passengers who arrived in Ballybunion were confined to compartments on either side of the divided carriages, which measured 17 feet long and 7 feet high, with the roof sloping toward the center on each side. Passengers sat with their back to the center rail, facing out each side rather than forward. The only way to cross from one side to the other of the stopped train was by using one of the exterior A-shaped stairways set between the carriages. The 3-foot, 3-inch high trestles were made of 1 ¾-inch thick angle iron cast in England and placed a meter apart. “It looks much more like a wire fence of an unusually substantial character than a railroad upon which whose single rail carriages are to run at speeds of 20 miles per hour,” the Times wrote. The Lartigue railway came to Kerry through a bit of coincidence and economic convenience. The story began in 1880, when the Limerick and Kerry Railway Co. built a conventional railway through Listowel. Residents of nearby Ballybunion soon began clamoring for a connection. Father Mortimer O’Connor, the parish priest, led the effort. He suggested that a rail connection would help the seaside village realize its full potential as a tourist and recreation resort. Some accounts suggest O’Connor might have calculated that more visitors to Ballybunion would also mean more money in his Sunday collection; perhaps enough to finance a new church. Tourism wasn’t O’Connor’s only reason for wanting to bring rail to Ballybunion. He told local officials that a rail connection would also provide critical transportation for rural students to attend the new secondary school in Listowel. And he said the Ballybunion sand pits south of the village presented an excellent commercial opportunity for the proposed railway. About the time O’Connor began preaching about rail transport, Charles Lartigue was some 1,800 miles away, in Algeria, where the French government was importing Esparto grass for thatch and cattle feed. He happened to watch a string of camels crossing the desert with loads hanging from each side of their bodies. The movement of the animals’ long legs inspired him. The engineer designed A-shaped trestles to carry a 60-mile elevated monorail over the shifting sands of the desert. His pannier-like wagons were constructed on bogies with wheels that ran along the single rail. The wagons were pulled by mules trudging along the sides of the track. In 1882, the 48-year-old Lartigue obtained a patent for his elevated rail and he formed the Anglo-French Lartigue Construction Company. He developed a partnership with another engineer, Anatole Mallet, who designed a double-boiler steam locomotive to balance over the elevated trestles and single rail. Back in Kerry, officials heard competing proposals for a tram or a narrow gauge railway to Ballybunion. They endorsed the tram in July 1884, which included plans to extend the line to nearby Ballylongford and the Tarbert Pier on the River Shannon. But landlords began circulating petitions against paying taxes to support the project. Some even protested outside Catholic churches after Mass. News of the ratepayer revolt reached Westminster, where a committee in the House of Commons was debating a bill to pay for the proposed rail system in Kerry. A competing Irish railway system also opposed extending a line to Ballybunion. Lartigue got word of the stalled Kerry rail project. In the summer of 1885 he built a short demonstration line of his monorail system in the Tothill Fields section of London. Private negotiations ensued behind the scenes. 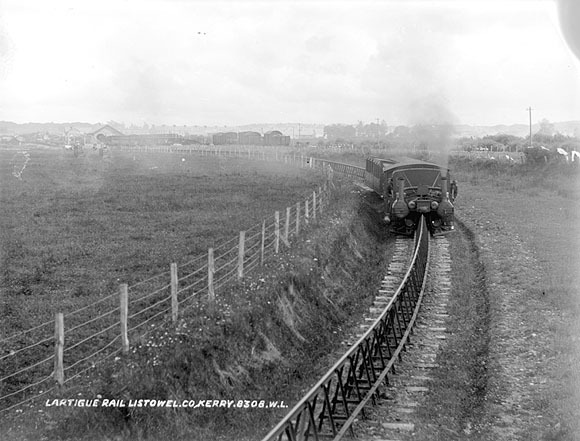 In November, Parliament proposed using Lartigue’s system for the line to Ballybunion. The bill to fund the project passed in April 1886. It provided a 33,000-pound government grant, but no tax guarantees to support the line, as was typical with other railways. The Lartigue line would include a short spur to the Ballybunion sand hills, owned by George Hewson, who agreed to sell the sand for a penny a ton. Land acquisition for the 9-mile rail line began in early 1887. There were a few holdouts along the proposed route. In one instance a mob of unemployed men is said to have intimidated a reluctant landowner to reach a deal. Construction began in the fall. Mallet’s vertical engine from the Tothill Fields demonstration project, known as the “coffee pot,” was shipped to Kerry to aid construction. Railway expert Fritz B. Behr of Germany was hired to manage the operation. Orders were placed with the Hunslet Engine Co. of Leeds for three twin 0-3-0 tender engines. Falcon Engine and Car Co. of Loughborough was hired to build 13 passengers carriages. A Belgium company was selected to manufacture 21 goods vehicles, including cattle wagons and special iron hopper-tipping wagons for carrying sand. Most of the Lartigue line, which took five months to build, followed the undulations of the countryside at grade. The route skirted the base of Mt.Knockanore, with its view of the rivers Cashen and Shannon flowing into the Atlantic to the south and the north, respectively, in the nub of northwest Kerry. At Listowel, a station was built next to the Limerick and Kerry Railway terminal, allowing passengers to walk between the two lines. The Ballybunion station opened behind the village’s main street with a special switch for the sand hill spur. A third station in the tiny crossroads community of Lisselton was about halfway between the two termini. Rail passengers could buy ship tickets to America at all three stations. Many did, and they never returned to Ireland. Because the elevated Lartigue was “more like a wire fence” than a conventional railroad bed, several clever methods were devised for crossing the line at farm roads. The most common of these devices were known as “flying gates.” They were double drawbridges with ramps on each side that, when lowered, allowed people, animals, carts (and later motor vehicles) to pass over at the level of the rail. “A child of seven years can raise or lower the bridges,” William Shortis, manager of the Ballybunion station, wrote in an 1898 article for Strand Magazine, a British publication. There were 17 such gates along the route, many with colorful local names such as Curraghatoosane, Dirra East, Shrone West, Ballydonohoe, Kilmulhane, Barnadarrig and Gortnaskeha. There also were five road bridges over the line, the first such structures in Kerry to use reinforced concrete, and a small steel suspension bridge across the River Gale, a tributary of the Cashen just outside Listowel. At Listowel and Ballybunion, manually operated turntables were used to spin the locomotive in the opposite direction. Other cars were shunted to parallel lines and could be coupled from either end. At the February 1888 opening, the Irish Times said “none was more astonished and delighted at the novelties” of the system than Lartigue himself. As a monorail, the Lartigue’s rolling stock ran on center wheels. The locomotives had three 24-inch diameter wheels; passenger carriages had four 19-inch diameter wheels, two at each end. “By this time it will, no doubt, have occurred to the reader that a vehicle running on a single rail, no matter how well balanced, must have some check,” Shortis wrote in his 1898 magazine article. The solution was guide wheels or rollers, two per side of all cars, which engaged with guide or check rails on each side of the A-shaped trestles, about two feet below the main rail. “The guide wheels are not required to carry weight, being merely used to control the oscillation, and their run on the guide rails is, so to speak, at right angles to the top or main wheels,” the article said. It was still critical to balance passengers and other loads. Station masters and train guards were required to become diplomats as they separated traveling parties due to the weight of individual members, especially in the smaller first-class carriages. Once, two engaged couples — an overweight pair and a slim twosome — were supposedly forced to split and match with their opposite gender and body type to balance the carriage’s left and right compartments. The story goes that two new pairs of lovers emerged from the trip. Another popular tale involved a farmer who purchased a cow in Listowel and had to borrow another to balance the first beast. On his arrival in Lisselton, the farmer had to borrow another cow to balance the return trip of the first borrowed animal. This continued back and forth until the farmer eventually had to send back the cow he had bought as balance for one of the borrowed animals. By comparison, the twin compartments of the sand wagons at the rear of the train were easy to balance. The Lartigue was busy, though rarely profitable, during its first 25 years of operation. About 40 people worked on the line. The Scanlon family of Ballybunion dug sand from the coastal pits with hand shovels, filling up to 40 of the Lartigue’s 5-ton iron hopper-tipping wagons per day. Today, the work site is part of the Ballybunion Golf Club, which opened for play in 1893. Summers were the busiest time for the line, especially when visitors flocked to Ballybunion for “Pattern Days,” a blend of devotional worship and secular festivities such as picnics and fireworks. Father O’Connor opened Ballybunion’s new church in August 1897. In September, crowds traveled in the opposite direction for horse racing at Listowel, which began in 1859. In April 1912, as news of the Titanic disaster captivated readers on both sides of the Atlantic, 38-year-old Gugliemo Marconi began to oversee construction of a new radio transmission station at Ballybunion. The Lartigue’s trestles were fortified with steel foundations, called sleepers, to support a new steam engine required to haul giant apparatus, including a 500-foot mast. The project was delayed by the onset of World War I and the station’s first transmission was postponed until 1919. The Lartigue system never became the revolution in railway construction predicted at the line’s grand opening. In 1899, Parliament rejected a proposal to build a 30-mile version of the line between Manchester and Liverpool. The Lartigue Construction Company was dissolved in 1906. Lartigue himself died the following year. Several factors caused the Lartigue railroad’s demise, including increased use of the automobile. A decade of war also hurt the system. The start of World War I in 1914, and the Easter Rising of 1916 and subsequent struggle for Irish independence kept passengers from the Kerry coast. Commerce dwindled. The ink was barely dry on the Anglo-Irish Treaty of December 1921 when the newly independent country fell into a two-year civil war. Britain relinquished control of Irish railways earlier in 1921. The provisional Irish government excluded the Lartigue from its amalgamation of the island’s railway systems because the equipment required special orders and couldn’t be use elsewhere in the country. Pro-treaty Irish Free State forces controlled the Lartigue during the civil war. Anti-treaty guerillas, who opposed partition of the island’s six northeast counties, sabotaged the line in strongly republican Kerry. On Aug. 10, 1924, the Lartigue broke down as a large number of people tried to reach Ballybunion for Pattern Days. Passengers were forced to walk while others were left stranded in Listowel. The Ballybunion Improvement Committee was created to urge the government to include the Lartigue in the national rail system. “The maintenance of an improved railway system is indispensable to the farmers, shopkeepers and fishermen of the surrounding districts and more important is the great advantage of the railway’s close connection to the Great Southern & Western Railway at Listowel, to farmers and contractors who for as far as 40 miles inland have been supplied with sea sand from Ballybunion to an extent of over 150,000 tons at very cheap rates,” the committee said in a resolution. The government denied the committee’s request for inclusion. On Oct. 7, 1924, the High Court in Dublin allowed the Lartigue’s receivers to sell off the line’s assets. The justice, perhaps familiar with the quirky railway, stated that “he did so with regret,” according to the Irish Times. The train made its last run a week later. “Known locally as the one-line railway, the Lartigue was an object of curiosity to all visitors to the district,” the newspaper concluded.